DO NOT USE ON FOALS UNDER 12 WEEKS OF AGE. Do not allow the product to contact horse’s eyes or mucous membranes. When finished, wrap applicator and put in trash. Do not reapply for 14 days (2 weeks). Do not allow the product to contact horse’s eyes or mucous membranes. (2 weeks). Pesticide Storage: Store in cool, dry place. Protect from freezing. Pesticide Disposal: If empty: Do not reuse container. Place in trash or offer for recycling if available. Call your local solid waste agency for disposal instructions. Never place unused product down any indoor or outdoor drain. For optimum effectiveness, apply one spot to each location pictured in diagram below. Apply to both the right AND left sides of the horse. Use all product in applicator. Hold the left and right sides of applicator between your thumb and index finger. With the back end of applicator tilted slightly downward, softly place the at edge of the applicator tip on the location where you want to apply the product. Slowly tip back end of applicator upward until a spot of product, approximately the size of a quarter, is expelled from applicator. 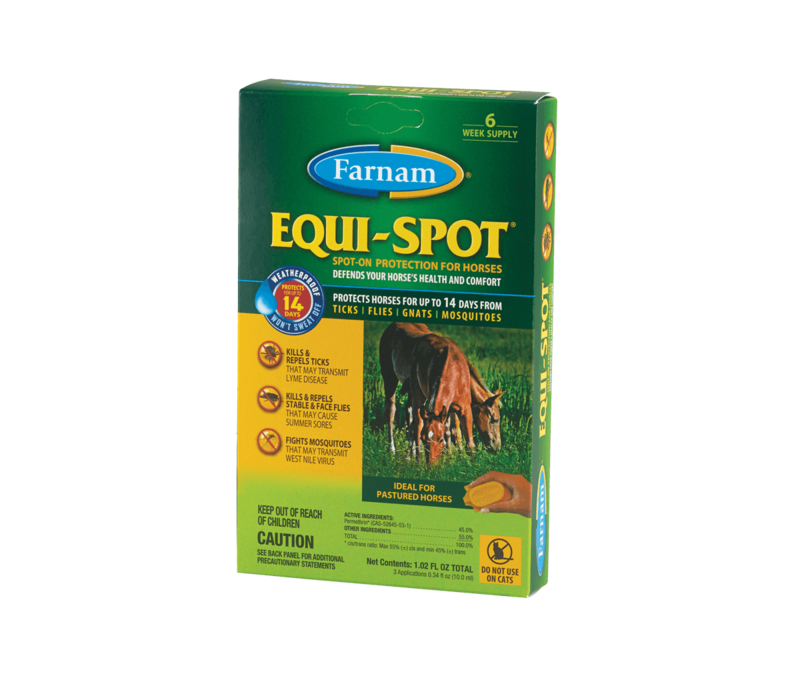 Equi-Spot® topical is most effective when applied such that it can spread over the largest portion of the horse’s body surface possible. For maximum protection, apply product as described below to the specified target areas in each Defense Zone.